Contacting people and telling them that they had better save all the money they make on their lease to pay for lawsuits, is not, as you put it, “raising awareness.” It is an attempt at intimidation and it is very befitting the term “troll” you throw around. If you want to take someone to lunch, why don’t you start by offering to take all the landowners you made these threatening overtures to out for lunch, to explain to them that you were only trying to “raise awareness,” not harass or intimidate. Wind does receive a great share of tax incentives. It is also one of the fastest-growing forms of energy generation. Shouldn’t the types of energy that are actually expanding in production receive the greatest incentives if there will be incentives? You also ignore that to date the fossil fuel industry has received much, much more assistance in the form of tax incentives than all the renewable energy platforms combined. It is true that every form of energy currently in production has an environmental cost. Your claims of the environmental cost of wind production are greatly exaggerated. I think if you do a quick study of available research, you will find the avian cost that you have cried doomsday over are generally under 1%. Similarly, if you ignore all research that proves no loss in property values and no traceable health defects, then yes, you would come to your conclusion. You also claim that you accept no tax benefit for your poultry operation. So manure sheds and feed bin pads do not receive any government support now? I would also like to ask you point blank for a comment on your definition of conflict of interest. You also had an in-law with a lease. So if everyone else that had a in-law with a lease, by your standards, should have abstained from voting (one zoning board member did abstain from the final vote I am told and you filed a complaint against him anyway) then why did you not recuse yourself? I have lived in Somerset County all my life and I have no clue who you are, which seems to defy your logic since you claim that people in “our” small county are connected. Raising public awareness about the consequences of wind should not intimidate wind leasers unless they believe it is true. I would like to buy Jorge and Josh lunch and discuss these issues. Please contact me to schedule lunch; if you are in Somerset, you will know how to reach me. Claiming wind facilities do not harm the local environment and nearby residents is a complete lie. I suspect you do not live anywhere near Somerset County and your financial survival is from the wind industry. I am very familiar with the trolls the wind industry pays to pounce on anyone who exposes the ugly truth. As a poultry farmer I do not receive subsidies, but yes, I deduct the expenses I pay to run my business just as other businesses do. The subsidy benefactors are the crop farmers and developers of renewable energy. Wind provides 3 to 4% of the energy but receives more than 42% of the subsidies. These subsidies are not proportionate to energy produced. Solar is even more abysmal. The Somerset planning and zoning board acted contrary to protecting health and public safety which is their function. The ethics panel used the weakest definition for conflicts because Somerset would be left without governance if the legal definition was applied. Ms. Truitt, I did not twist your words. You said quite specifically that wind survives on mandates. Kansas has no mandate. Your hypocrisy shows again, however, when you talk about grain farmers receiving subsidies. You have said before that tax credits are subsidies. Are you now claiming that poultry farmers do not file tax credits and tax deductions? On the point of subsidies would you care to note how many billions the fossil fuel industry has received to date? I have made several trips to the website you mention and do not see a lot of credible information. You have two opinion articles and a document of an appeal of real estate assessment on ONE house in VT that is apparently supposed to prove that wind turbines have a negative effect on real estate. Also you served on the zoning board so you should know that no commissioner has a father who owns a grain facility and was also the largest lease holder. You also bring up conflicts of interest. I assume you know that the Ethics Board did not find a conflict of interest. You accuse others of ethics violations because they had in-laws involved with the Great Bay project, but you yourself had an in-law that held a lease from what I have been told. If you contend that others should have recused themselves, then shouldn’t you have done so also? Your comment “reached out to lease holders over concerns of their liability” is a bit of a twist. I have corresponded with several people that say you personally contacted them in some half-witted attempt to intimidate them. Tammy, first off my name is Jorge Bush. Google me. Secondly, your responses perfectly illustrate how powerful the agricultural lobby is. Ag gets many thousand times the subsidies of renewables, yet you hear no complaints from those self-proclaimed defenders of the little guy like Tammy. Tammy’s own poultry industry receives billions of dollars in indirect agricultural subsidies that artificially reduce the cost of the most expensive part of her business: corn and soy grown to feed billions of birds. Tufts University estimates that the chicken industry alone saved $1.25 billion in feed costs from 1997 to 2005 just from taxpayer-funded subsidies. Third, everyone in Somerset County is related to someone in some industry that is regulated by the local government. All of the connections you point to can be made in your own industry, Tammy. All of the farmers and homeowners and business people in your group are related in one way or another to people in the county who permitted their chicken house or restaurant or home remodel. It’s unbelievable hypocritical to throw stones at county staff and representatives for doing their job and living in a small county like ours. If someone wanted to dedicate their life to throwing stones and creating fake controversy by accusing Tammy Truitt of being in bed with various government officials because, for example, her family is in the chicken farming business and chicken farms have to get permits, one could make Tammy look even worse than she already looks by casting guilt by association throughout the county to friends, neighbors, and even relatives alike. Shame, shame, shame, Ms. Truitt. Shame on you. These two commenters are perfect examples of how strong the wind lobby has become. Interesting that you are hiding behind the alias Jorge Bush. I am a poultry farmer and do not receive subsidies like the large land owners who plant crops. And yes, these farmers receive thousands of dollars in subsidies every year which they have continued to collect while being paid by the wind industry for leases. These same people pay pennies on the dollar compared to what homeowners pay for the privilege of owning land. Safe For Somerset reached out to land leasers throughout this ordeal over concerns of their liability. Many wind leasers in other projects have been slapped with lawsuits and liens because of the unscrupulous practices of the wind industry. A visit to Safe For Somerset’s website will clearly show our concerns are valid. Health and public safety are important to the people of Somerset County and should be to all peoples even wind developers. Unfortunately, after many hours of research, it was evident that safety recommendations were being ignored in favor of project development. Safe For Somerset sent maps to residents within 2 miles of the turbine sites and encouraged residents to learn more about wind development and to discuss it with county officials. This was done because the developer was keeping specific details of the project from locals. Many of these folks had no clue they would be living in the midst of a 600-700′ wind turbines. And Mr. Kern should stop twisting my words. I did not say the wind industry did not care about wind resource, but said, wind resource is not included in the top three considerations when developing a wind facility which is quiet obvious here in Somerset because of its poor/marginal wind rating. Josh Kern states that KS has no state incentives for wind and therefore wind development there does not need subsidies. What a joke because the Federal subsidies are being supplied at taxpayers expense, while the renewable credits are being sold to polluters to allow them to continue to pollute. Not to mention the electric payers who are now paying for two sources of energy while only receiving the benefits of one. The ethics board admitted the weakest definition was used to determine whether violations existed because our officials would not have met the muster of the more stringent legal definition. The ethics board admitted officials were in violation of state ethics laws. A county commissioner’s son-in-law holds a wind lease, the county attorney’s father-in-law, and stepson’s father have lease contracts, and many of his clients are wind leasers. These contracts are for 30 year terms, so many of these players will inherit these leases. By the way, the county attorney’s brother is a county commissioner. Two members of the planning commission have close relationships with land leasers. One of which husband is a partner with a person who holds multiple land leases and whose daughter purchased a property which the land leaser financed. The other commissioner’s sister’s husband holds a lease and during planning and zoning sessions he openly discussed partnering with his sister in order to waive setbacks under the “good neighbor” contract so they could benefit for additional turbine leases. This same commissioner works at a grain facility that is owned by his dad and the largest wind leaser. All the while health experts and scientists were being ignored when recommending setbacks that would limit the effects of low frequency noise and property values on nearby residents. Pioneer Green repeated in presentation after presentation beginning in 2012 the term, “Maryland’s poorest county,” so if you missed it, you were not listening. Your response to my comments precisely supported my point that you and yours pick and choose exceptions to the rule to support your case and dismiss anyone else who doesn’t agree with you as a crony or buffoon. It is amazing that you don’t see it. Your group does not seek to tell the truth about wind energy. You seek only to support your opinion that wind energy is bad. A fair assessment of the wind industry in the U.S. would show that the vast majority of wind farms are win-wins for the environment, the local community, farmers, ranchers, and even property values (the largest study done of actual impacts on property values found an insignificant INCREASE in values due to lower property tax rates in communities with wind farms). But take a moment to go to the Safe For Somerset website and it’s as if Satan himself invented the wind industry. That is not courageous truth-telling. It’s blind propaganda. For every example your group comes up with of how wind is bad I can produce 20 saying the opposite. But does your group ever acknowledge these facts? Not once. Not ever. Because you’re more interested in being right than telling people the truth. You should be ashamed of yourself. I hope you enjoy reading this on a computer powered by the coal and gas industry that received 100 years of subsidies to get where they are today, with money aplenty to pay for lies to be spread and swallowed whole by fools like you. Oh, and the irony that your bills are paid for by a heavily-subsidized agricultural industry so you can spend your days fighting the much smaller subsidies received by the U.S. wind industry. Do everyone a favor and stay at home and leave us all in peace! Shame on all of you SFS fools! Ms. Truitt, what hypocrisy you display. You speak of the wind industry dividing communities, but what of all the attacks your group has made against hosting landowners? What of the phone calls and Internet messages YOU sent out to hosting landowners in an attempt to intimidate them? You also nitpick select cases that support your theories while ignoring all the research and information that dismisses your theories. You also tell quite a few falsehoods in your interview. You claim the wind industry does not even care about wind availability and that there is no wind in Somerset, but I believe you know very well that Pioneer placed two MET towers in Somerset to ensure that there was sufficient wind. You also claim that Pioneer specifically leased land from “politically connected” individuals which was the exact allegation you made in your ethics complaint which was shot down. You claim Pioneer “harped” on how poor our county was but I do not recall them ever “harping” on how poor the county was. You also claim that wind only survives due to mandates. Were you unaware that wind is very successful in Kansas which has no green energy mandate? Just want to point out the comments of Jorge Bush are lies. Safe For Somerset consists of hundreds of locals who have researched the issues and understand the risks to health, safety, property values and the environment. Rulings regarding health and property values such as the Brown County WI Board of Health’s declaration that The Shirley Wind project (8 turbines, 492′ tall) is a public health hazard and VT’s lowering of property values for homesteads less than a mile from the Georgia Mountain wind facility, (4 turbines, 440′ tall) because of noise and negative aesthetics. As evidenced by Jorge Bush’s comments, the wind industry divides communities and pits those who will benefit against those who will bare the burdens, because dividing communities increases the chance of a project’s development. This increases the importance for local officials to recognize hazards early. I have been a reader of this site for years and I have never had occasion to comment until now. I must admit that this article is a poor example of the kind of critical journalism I have come to expect from this site. Of the group’s most active members, none is as uniformly reviled in the County in which she lives than Tammy Truitt. With nothing better to do with her sad life, she spends all of her time erecting straw men then knocking them down and declaring victory. This group of hypocrites are mostly outsiders who relocated to our county and do nothing but tell the good people of Somerset County what to do with their lives. Many of them enjoy precisely the same kinds of subsidies in their own businesses, from huge agricultural subsidies to fossil fuel subsidies to taxpayer funded programs, that they courageously stand up against when others like the wind industry try to do business in our county, the poorest county in Maryland. These are the lowest of low lives, bitter people who want to make sure that their poor neighbors don’t have a chance to make their lives better. They play dirty politics. They intimidate neighbors and post landowner addresses on their website for all to see. They lob merit-less accusations of corruption against the County Commissioners on the grounds that distant relatives are project landowners, never mind the fact that Truitt’s own family are landowners in the Pioneer project. They pick and choose evidence to support their view rather than look to the overwhelming evidence of the thousands of operating wind turbines that are creating win-win situations for counties, landowners, farmers, ranchers, and the environment across the country. We can not expect more from people like this, the same kinds of people who are driving businesses away from California by the hundreds. 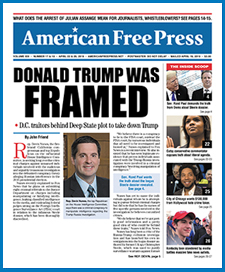 But we certainly can expect better from AmericanFreePress.net. You’re supposed to be real journalists, not mouthpieces for those that are factually incorrect but most vocal. Shame on you for posting this article without exposing these arguments for the BS that they are. Thank you, Tammy C. Truitt and the good citizens of Somerset County. Ecological sustainability requires that we protect ourselves and the landscape from this new breed of corporate-financial robber barons. You are amazing! Thank you Dave for covering this story. You and your community may call yourself heroes of our time. Tammy thank you making a stand against an enormous and influencing Mafia! Wind farms are in reality to unsystematic and conceptless distribution of wind turbines Which destroy sustainable landscape. The wind turbines will not provide the communities with electricity, but it is only deducted the natural resources to the expense of the quality of life of the region by the wind-turbine operators. Up to 40% may be converted from modern wind turbines in electric power. A very small part of the rest is converted into heat and most of the rest in INFRA SOUND; that is, the modern megawatts—3 MW turbines on top of performance each pollute the environment with about 1.5 million watts INFRA SOUND. Whether this is good for people and animals? In any event, there are sufficient amounts of testimonials of concerned citizen (worldwide) that this is not the case. On studies that have commissioned the wind lobby to certify that either no or very little infrasound is emitted these are pure complacency reports or studies originating from the 80s where wind turbines were up to a maximum of 80 feet high. Blessings to Chesapeake Bay and congratulations to this huge success. Keep up your good work and share with other concerned citizenry, create citizens’ initiatives if necessary and keep a stiff upper lip.